Beginners, this single Irish chain quilt pattern is simple to make - stitch 6 inch blocks from strip sets fast! See modern and traditional looks. According to quilt historian Barbara Brackman the Irish Chain pattern has been around since the early 1800s (Clues in the Calico: A Guide to Identifying and Dating Antique Quilts, 1989). There are a few versions of the pattern - single, double and triple Irish chain. This tutorial covers the single chain. From what I've seen, whether the pattern originated in Ireland and migrated here with early settlers or is a true American discovery is somewhat unclear and debatable. However, it remains popular today. One thing is for sure, your heritage doesn't have to be Irish for you to enjoy a quilt made of this splendid design! It is very easy to put together as it is a basic nine patch. Make and use strip sets to make the block more quickly. And, if you use jellyrolls (precut 2 1/2 inch strips) you can make strip sets even faster. 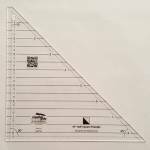 Of course, you can cut your own 2 1/2 inch strips as done in this tutorial. In addition to your usual quilting supplies here are your fabric requirements, based on at least 42 inches usable fabric. Rounded to the nearest 1/4 yard. 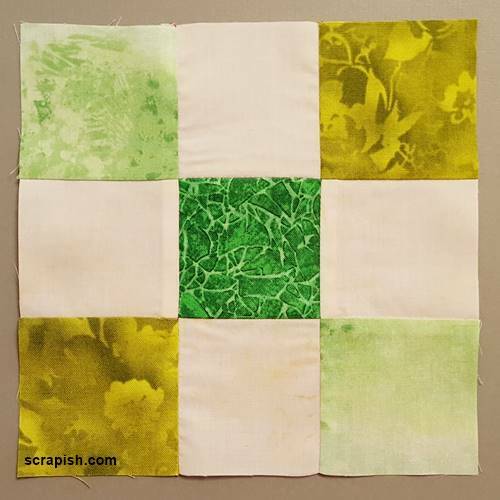 This single chain Irish quilt uses two blocks: a Single Irish Chain quilt block and a plain square. Step 1a: Cut Fabric for Strip Sets. From Fabrics A, B, C and D cut 2 1/2 inch by WOF strips according to the Fabric Cutting List above. Step 1b: Group Fabric for Strip Sets. You should end up with 13 Strip Set A and 7 Strip Sets B fabric piles. 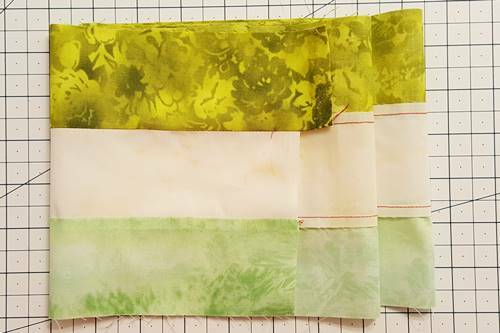 Step 2a: Make 13 of Strip Set A.
Stitch together one each of Fabric B (light green), Fabric A (cream) and Fabric C (medium green) to make one Strip Set A. (Basics: How to Make a Strip Set, which will open in a new window). 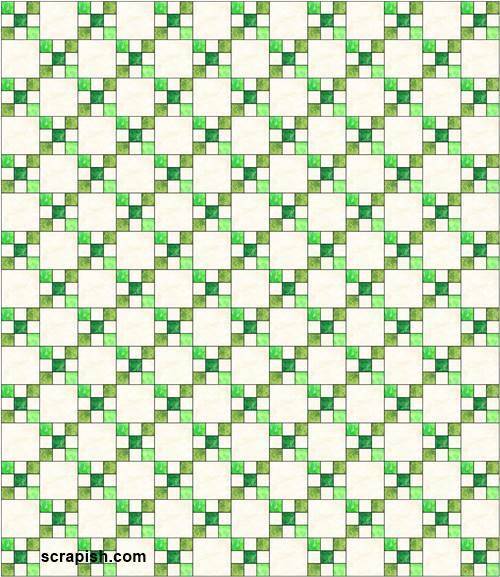 Stitch together 12 more of Strip Set A, for a total of 13 in this Irish chain quilt pattern. Step 2b: Make 7 of Strip Set B.
Stitch together one each of Fabric A (cream), Fabric D (dark green) and Fabric A (cream) to make one Strip Set B.
Stitch together 6 more of Strip Set B, for a total of 7. Step 3a Make Irish Chain Quilt Blocks. Make 98 Irish chain quilt blocks. This block is a nine patch block. Instead of individually sewing each square together we made strip sets which you now need to subcut into 2 1/2 inch units and stitch together into 6 1/2 inch unfinished blocks. block (opens in a new window). When you have made 98 Irish chain quilt blocks, come back here and continue to Step 3b. Step 3b: Trim all the Irish chain blocks to 6 1/2 inches, or the size of the smallest block, which may be a little less than 6 1/2 inches. 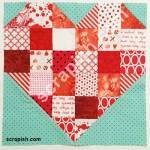 Using the 17 (6 1/2 inch by WOF) strips; subcut 97 (6 1/2 inch) squares (Block B). 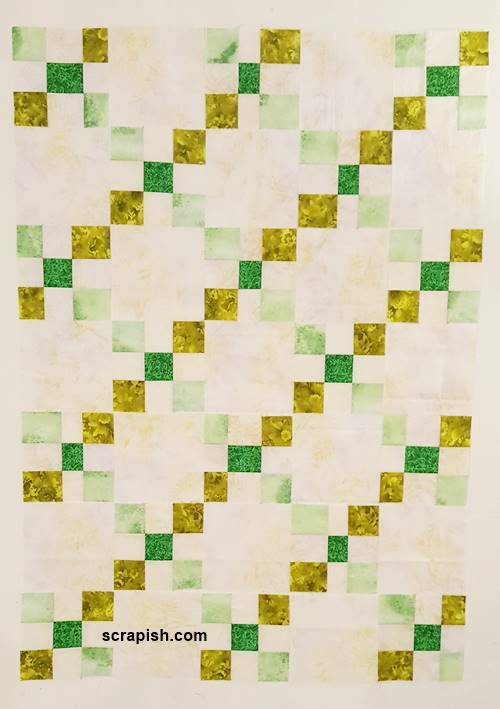 Or, subcut the squares to the same size as you trimmed all of the blocks to in Step 3b of this Irish chain quilt pattern. For the steps below, refer to the above Irish Chain Quilt Pattern Quilt Assembly Diagram. Step 5a: Layout Quilt Blocks. Layout the 6 1/2 inch Irish chain quilt blocks and plain 6 1/2 inch squares as shown in the Quilt Assembly Diagram. 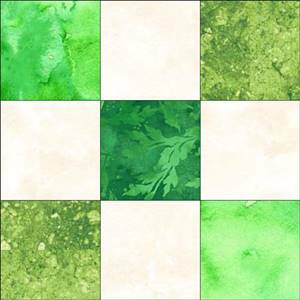 Start by laying out a single Irish chain block and then a plain square, alternating the blocks within each row and between rows. Step 5b: Stitch the blocks of each row together. Press seams of Row 1 to the right and press the seams of each successive row in the opposite direction of the previous row. Step 5c: Stitch each row together. Press the seam between rows downward. Batting: Purchase and use prepackaged queen size. Cut it to 82 inches X 94 inches. 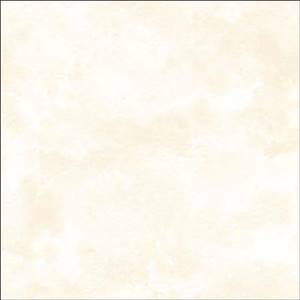 Backing: Purchase and use 3 yards of 108 inch wide backing fabric. Cut it to 86 x 98 inches. 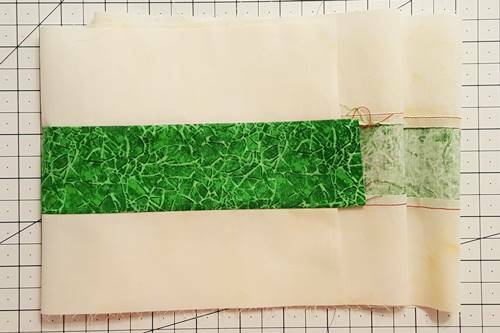 Put the Irish chain quilt pattern quilt sandwich together by layering it in this order: the backing, batting and quilt top. Pin baste the three layers together. From the 3/4 yard of fabric cut 9 (2 1/2 x WOF) strips, trim selvages and join to make a single long binding strip. This Single Irish Chain quilt pattern is oh so easy to make! 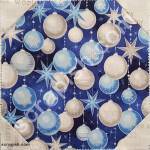 Beginner and experienced quilters alike, have fun making this lovely design. Raid your fabric stash. Choose another color scheme and really make it your own! 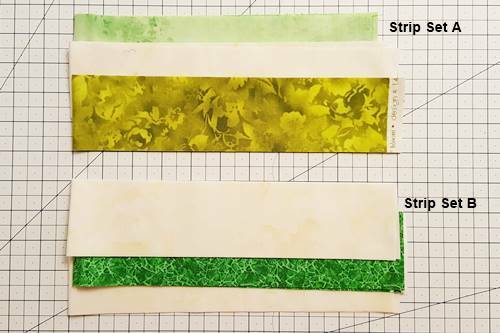 One way to get a more modern feel for your quilt pattern is to cut the strip set units into different widths. Here you can see on my design board that I mixed and matched the more traditional blocks, made of equal width units, and the more modern blocks that were pieced with units of unequal widths. Take a look here to see how the modern Irish chain quilt blocks were made.